Let the day slip away on Samui's most tranquil beach. Save big on your next Samui holiday and enjoy free Wi-Fi during your stay at Centra Coconut Beach Resort Samui. Amazing hotel, great food the sevice is fantastic only downside is that it is on a secluded location. Takes about 20 mins to get to Lamai and 1hr to chaweng. The staff are lovely very kind and helpful. There's a shuttle service provided by the hotel twice a day to the main city. This hotel is really out of the way and we loved it. About a 10 minute walk to small shop and about 20 minute walk to the nearest proper shops, 7/11 and a Family Mart. There are cheap shuttles in to Lamai and Chaweng though every afternoon and evening so you can get about easily if you want. The breakfasts are great, with all you can eat and freshly cooked eggs and decent coffee. Evening meals are lovely and happy hour 5-7pm for cocktails. tables right next to the beach and so very romantic. We had a room right next to pool so you literally opend your balcony door and could jump in to the pool. Just fabulous and it's a 72m pool! Going in April, very quiet so wonderful. Suspect when it's busy the long length of pool could make it noisy. You are right next to the beach and there are no hawkers at all. There are a few dogs but they are fine. Yes, we did feed them! The nearest 'village' has two shops as i said and they have everything you could need. Plus there is a great massgae place there. We went 4 times in a week. Try the traditional Thai one with hot stones. Amazing! Plus there is a great restaurnat opposite 7-11 for lunch. Also a stall which breaks up the 20 minute walk for fresh coconut juice. The service at the hotel is perfect. Couldnt be better and more helpful. The hotel itself needs a refresh, but is great. Our air con went and we just changed rooms, easily solved. The other reviews are right. Pre book hotel transfer. It's about 55 minutes journey as you are right in the South west corner of the island..bliss! Positive: My partner got very sick during our holiday. The staff was so helpfull and took good care of us. They Even bring me many times to the Hospital. Stayed for around a week in April 2016. The hotel is almost an hour away from the airport and the closest tourist spot with a strip of pubs and clubs is Lamai which is 15-20 minutes away. We spent one night out in Lamai when we got a meal, had some drinks and did some shopping at the stalls they have there. This was nice for a change of pace. We paid 100TB each to get the hotel shuttle there at 730pm then 500TB for a private taxi back around 1am - not much more than £5 each to get you in and out. 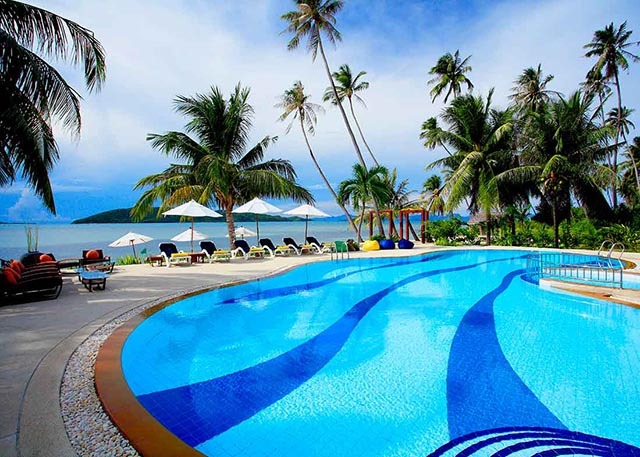 Most people come to samui to just relax and this hotel is perfect for that. The pool was a few feet from our bed, the beach a 5 minute walk through the resort and the bar/restaurant. We ate at the hotel most nights as the food was good and menu had variety. They do a BBQ on Fridays (?) and this was excellent. Generally was very impressed with the quality of the local produce on offer. Ate out at fench kiss one night (5 min walk down beach to left) and it was grand. The breakfast on offer by hotel was very good, eggs any way you like cooked to order, breads/pastries, fresh fruit, cereal, bacon and sausage. I rented a scooter 2 or 3 days to get around the island, booked the seawalking this way directly, we visited the waterfalls (good cheap day out), had lunch in Lamai, did some shopping and sightseeing. I also used that to stock up the fridge with drinks and snacks. The hotel has pretty good WiFi which stretched to the beach as far as I recall. We had a great experience here and wouldn't hesitate to return, as stated above Samui is about relaxation and this place is perfect. I think you would struggle to find another hotel with a beach as remote and tranquil as this. Away from the hustle and bustle of Chawang and Lamai sat amid coconut plantations on the quiet and unspoilt southern tip of Ko Samui. Centra are slowly upgrading the facilities and there has been a noticeable improvement in the food and cocktail quality. You don't get any hawkers on the beach waking you up to sell you anything and if you want a long tail boat trip to the nearby islands for snorkelling or just a day out you only have to walk 200 meters to book one. The hotel provided a cheap shuttle service to Chawang, Lamai or Nathon throughout the week make sure you check which day and which town so you can book your place early. Sunday is walking street market in Lamai a 20 minute drive away which is serviced by the hotel shuttle. The hotel management and staff are extremely friendly and helpful. Special thanks to Agy, Bo, Golf, Ohm, Sa, Su and all the breakfast and dinner crew. Another good chill out and excellent value.